I don’t play Dungeons & Dragons anymore. Not because I don’t like the game, but I don’t think I will ever find a group as good as my old one. When I was living in Mississippi I got in touch with a group of guys and over the years we built up our group. Every Friday night we would meet and play and socialize. We never had a specific name. The term “Mithril Buddy” is an in-game joke we came up with. (One of the few that weren’t R-rated.) We didn’t care about naming ourselves. We would just play and laugh together. And we didn’t only play D&D but many other games as well. It was a good way to cap off the week. We went to SF/F conventions together, watched the LOTR Trilogy together as a “group project” and generally had a great time. One of the guys we used to play with isn’t in this picture, he was living in Arizona at the time. But along with him this was the core group and they are the Mithril Buddies, in every sense of the word. I don’t get to see them as often since I moved to Texas. Some of the guys have moved away too. This picture is from August of last year, IIRC. I get down there when I can, but it’s not as often as I would like. Yes Mark. The game takes place on a Ship!! I’m not sure if we got together to game, or if we got together to shoot the breeze, and the gaming was the perfect excuse. It was a magical experience. Since moving to AZ, I’ve tried to recapture the enchantment, and met with sub par results. You are indeed correct. Mithril Buddies, or Priceless Friends is a good summation or the group. I’m not sure how brazen to be on your blog, so I’ll keep my R rated stories to myself, but I still say… you did NOT think there was a nest in those trees!! 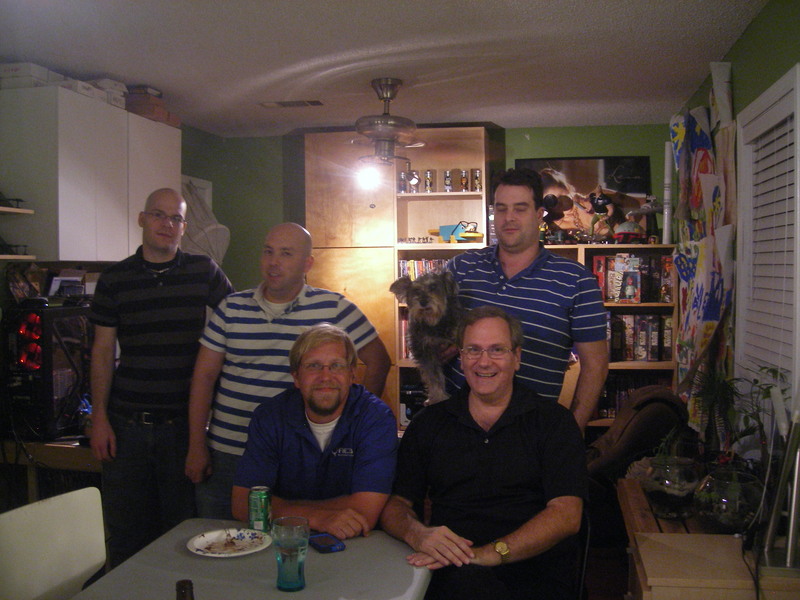 Our get togethers were a mixture of laughther, and camraderie that is unlikely to be found again. I miss it greatly. Drop me an email, I think perhaps technology may have caught up enough for us to try gaming online again. I’d be happy to walk you thru the set up, and mail you a headset so we’re not teaching your kids more new words! At the very least you could occasionally hang out with us in Team Speak and shoot the breeze. Even Joe hops in like once a year! I would love to get together with you guys again on Team Speak. I remember the guys were talking about it a while ago, but I was busy finishing the novel and I didn’t know if they ever got it set up. Guess they did. As I said in the blog I am not even going to try to find a group. Nothing is going to match what we had. It was a perfect mix and I miss it a lot, but I’m glad I was able to experience it. I miss it a lot and I know it can’t be recreated in another group so why try. And, yes, there was a nest in those trees. And, yes, we had a deal!